OrangeTwist Brands is not your typical doctors office, in fact they are the opposite. The company is at the forefront of changing the 40 billion dollar aesthetic market. They strive to provide the best in aesthetic services from a highly trained staff and in a simple, elegant and relaxing environment. Their clients want to visit not because they have to but because it feels like home. Founded by aesthetic industry leaders Clint Carnell, and Grant Stevens, MD, a visit to OrangeTwist ensures a client makes aesthetic treatments a necessity in their life, not just a luxury purchase. Differing from traditional doctors’ offices, OrangeTwist markets to the client, focusing on the client’s needs and wants by creating inviting facilities and and staffing expert team members. They have grown to be the biggest provider of CoolScupting, treating more patients than anyone else in the nation. Now the company is focused on expanding the brand both geographically across the nation and by offering new and exciting aesthetic services to their clients. With expansion comes capital raising and the need for new partners. 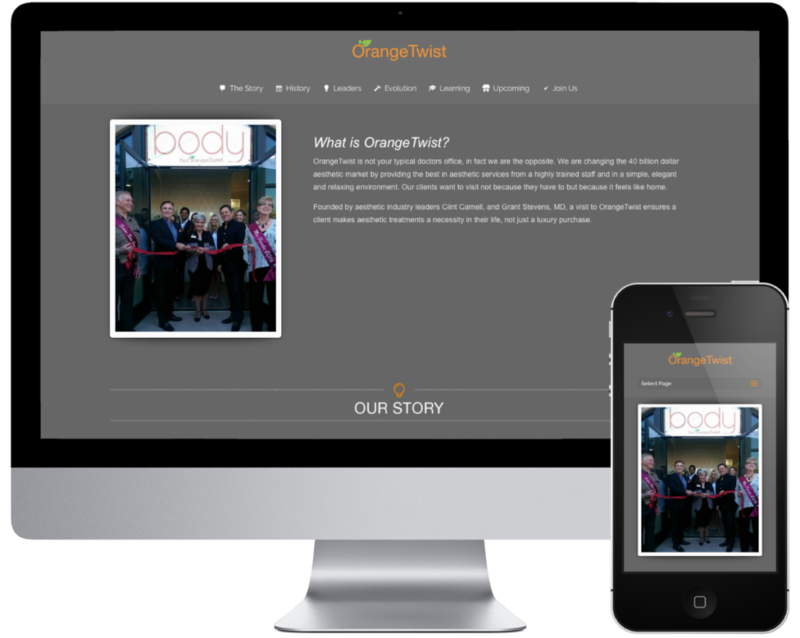 OrangeTwist Brands asked SpringSEO to create a fun, interactive, and informative corporate brand website that would be used to show potential and existing investors just what the company is doing. The site also needed a secure log in and password protected pages for current investors to view development documents and company progress. SpringSEO was happy to achieve the look and feel for what OrangeTwist desired. We look forward to helping you on your company’s site as well! Put some spring in your business!